Music for All announced Miami University in Oxford, Ohio, as the location of a Bands of America regional to be held Sept. 22. The university’s Yager Stadium, located approximately 1 hour southwest of Dayton, last hosted a BOA regional in 2007. On March 22, Music for All marketing coordinator Lucy Wotell declined to confirm the location, saying the organization is still awaiting confirmation of a venue for the Sept. 22 regional in Southwest Ohio. On March 29, the organization posted announcements of the new venue on its social media profiles and later updated their website to list the new venue. The location of this first-weekend regional had been in question for over a month since the Dayton Flyers announced their 2018 football schedule in early February. 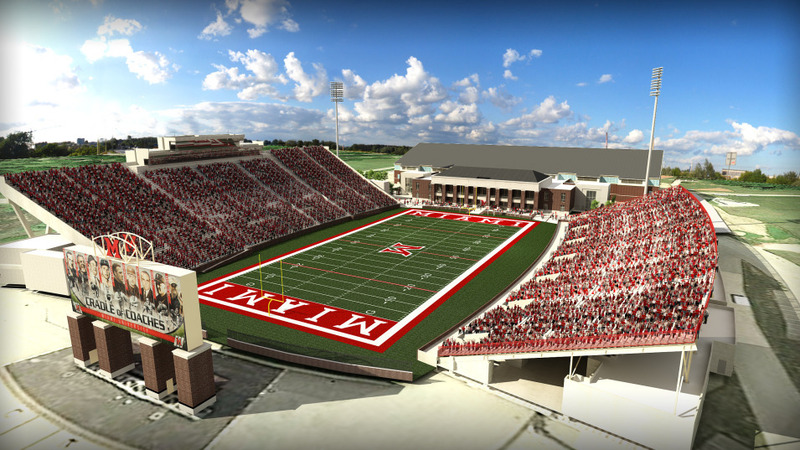 The football team has a home game at Welcome Stadium, the previously announced location, the same day as the regional. Miami University marching band director Stephen Lytle said the stadium seats around 15,000 on the home side, more than the entire seating capacity at Welcome Stadium. These larger stands will result in a higher vantage point for judges and more prime seating available for spectators. Lytle said hosting the regional creates some big opportunities for Miami University students. Lytle said he’s eager to promote the Miami University Marching Band to BOA participants, but also wants to encourage high school students to participate in marching band at whatever college they attend. “We wish to show students that they can continue the level of performance they currently enjoy at the collegiate level as well,” Lytle said. Five regionals remain without confirmed venues: a Dallas-area regional on Oct. 6, a North Carolina regional on Oct. 13, a Northern California regional on Oct. 20, a Mid-Atlantic regional on Oct. 20, and a Southern California regional on Nov. 3.